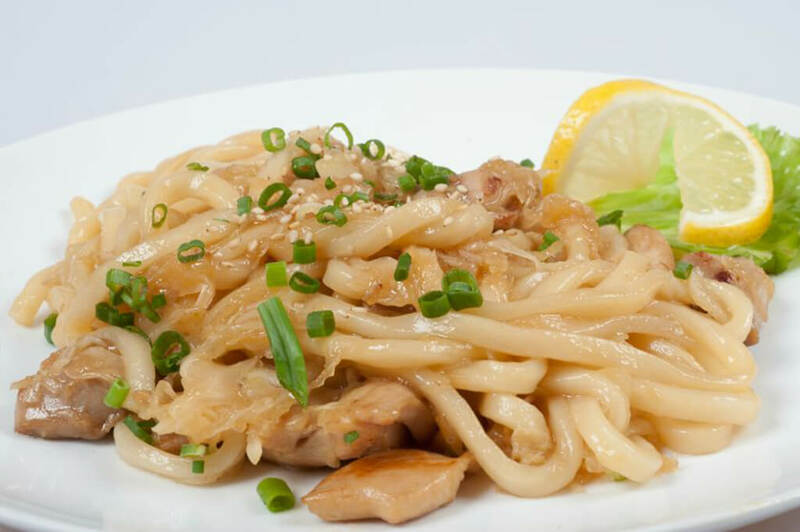 Delicious Japanese stir fry consisting of thick udon noodles mixed with tender chicken & cabbage. Tender, juicy tenderloin steak with ramen noodles. Tasty, fresh chicken with ramen noodles. Ramen noodle with pork belly and kimchi. Thick Japanese noodle or buckwheat noodle soup with kimchi & shrimp tempura. Ramen noodle with pork belly. Thick Japanese noodle or buckwheat noodle soup with tenderloin steak. 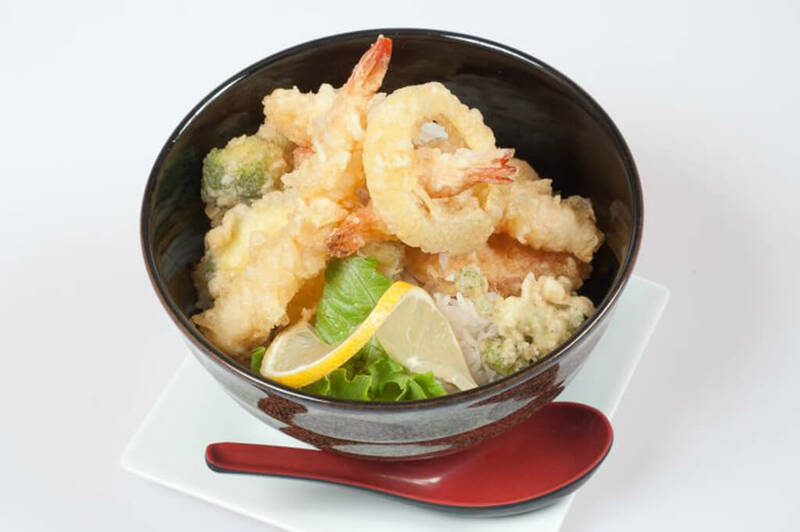 Thick Japanese noodle or buckwheat noodle soup with shrimp & vegetable tempura. Cold buckwheat noodle with shrimp & vegetable tempura with dipping sauce. Beef & onion over rice with sweet dashi sauce. Chicken, egg, & onion over rice with sweet dashi sauce. Shrimp & vegetable tempura over rice with sweet dashi sauce. Deep fried pork, egg & onion over rice with sweet dashi sauce. Sushi rice mixed with green onions, crab, masago, & sesame seaweed seasonings. Broiled eel over rice with unagi sauce. 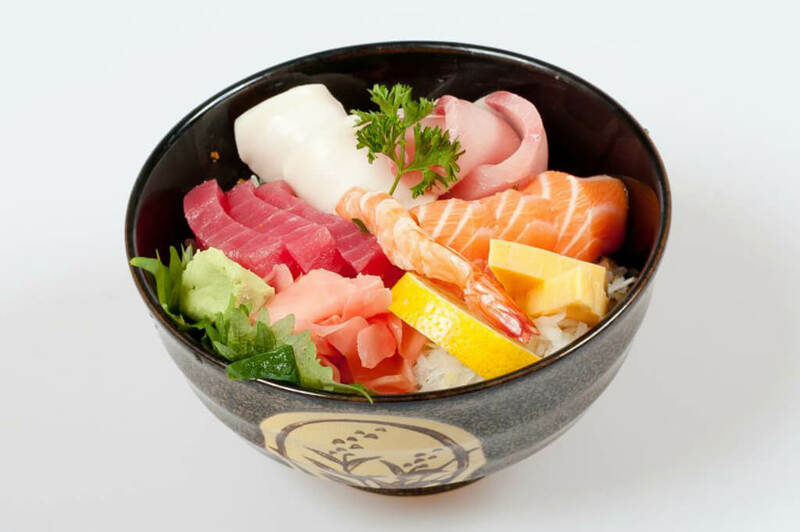 Sliced variety sashimi over seasoned sushi rice. Korean style rice bowl with assorted sashimi & mixed lettuce with chili paste. 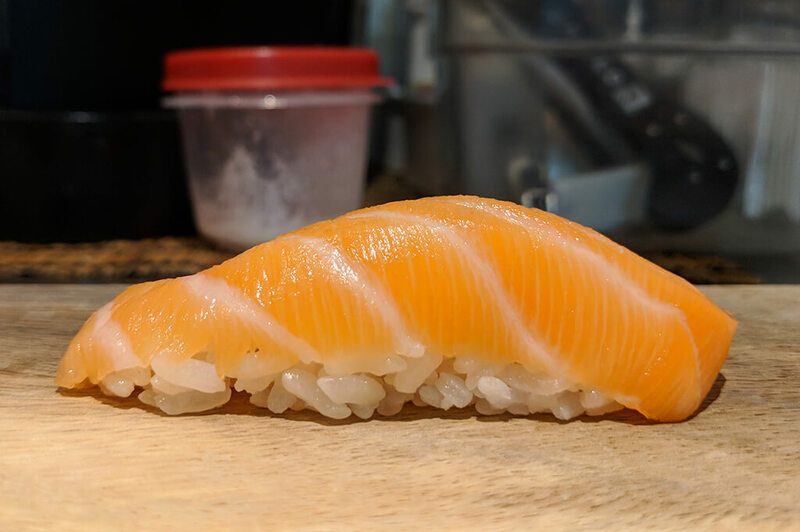 Sliced salmon sashimi over seasoned sushi rice. 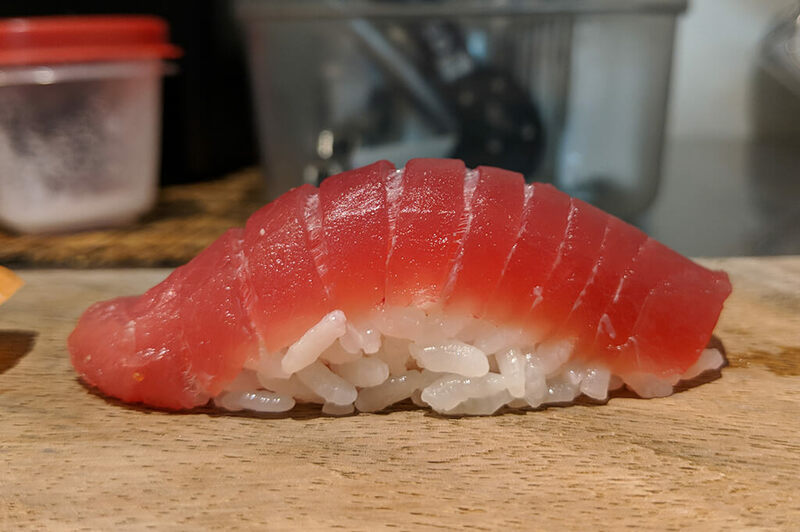 Sliced tuna sashimi over seasoned sushi rice. 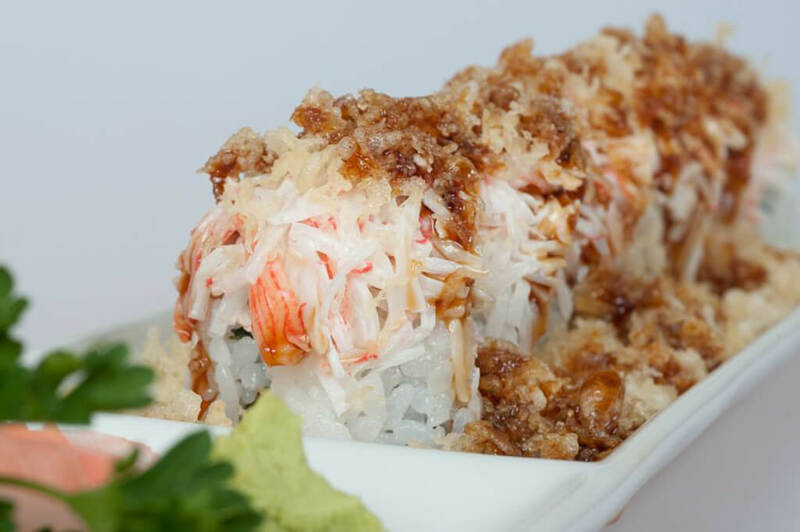 California, Spicy Crab, & Kappa maki. California, Spicy Tuna, & Ebi Tempura maki. California, Rainbow, & Spider maki. 6 pieces of chef choice nigiri sushi & California roll. 12 pieces of chef choice nigiri sushi & Ebi Tempura roll. 16 pieces of chef choice nigiri sushi, California roll & Spider roll. 20 pieces of chef choice sashimi. 40 pieces of chef choice sashimi. 9 pieces of chef choice sashimi, 8 pieces of chef choice nigiri & 3 pieces of tekka & kappa roll. Thinly sliced marinated beef with sweet garlic soy sauce. Grilled chicken in a sweet soy sauce. Grilled chicken in a sweet & spicy soy sauce. Grilled mackerel with ponzu sauce. Grilled salmon in a sweet soy sauce. Tenderloin steak grilled with sweet soy sauce. Chili marinated pork with onions. Shittake mushroom & avocado maki. Tofu, oshinko, tamago, cream cheese, avocado & shitake mushroom with spicy mayo and sweet sauce. Tofu oshinko, tamago, cucumber, avocado & shitake mushroom. Jalapeno tempura, shitake mushroom, avocado & cream cheese. Sweet potato, shitake mushroom, cucumber & avocado on top with sweet soy sauce. Deep fried Tofu with sweet and spicy mayo. Lightly fried tofu in a fish broth or teriyaki sauce. 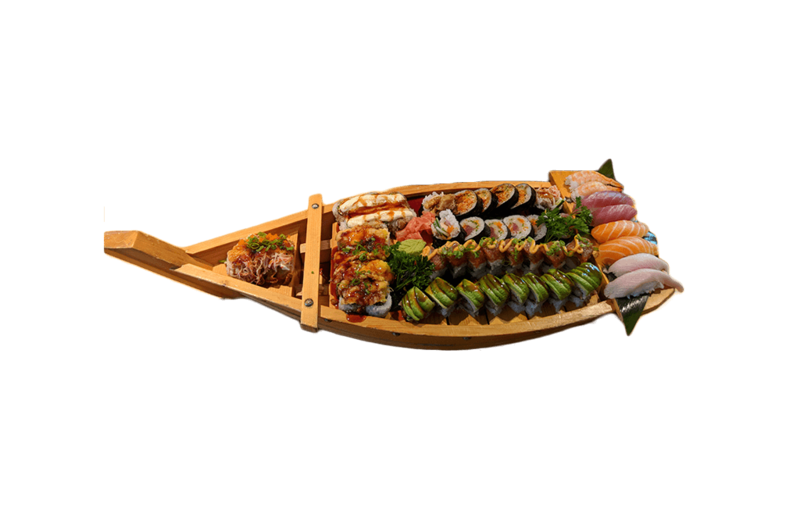 Served with soup, salad, Chicken Karaage, Minami Crab Rangoon, Crazy Roll, Spider, Caterpillar, Japanese Lasagna, Yellow Submarine, Tasty Ex, and 8 pieces of Nigiri Sushi. Crab salad, avocado & cucumber. Soft shell crab, cucumber, and spicy crab with eel sauce. Shrimp, avocado, masago & mayo. Eel, cucumber, shrimp temp & avocado on top. Eel and avocado on top of California. Shrimp tempura, crab, cucumber, and avocado. Shrimp and avocado on top of California roll. 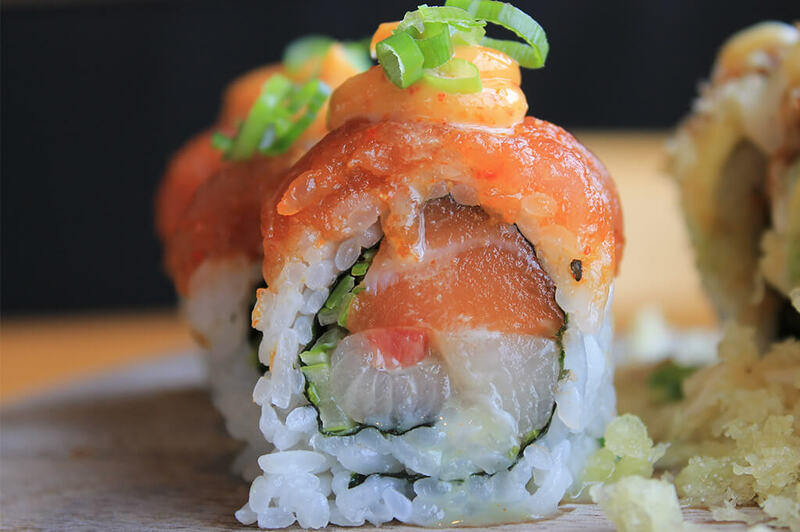 Deep-fried salmon, avocado, cream cheese roll with hot sauce. Tuna, crunch flakes, and spicy mayo. Salmon, crunch flakes, and spicy mayo. White tuna, cucumber, avocado and masago. Scallop tempura, cucumber, avocado and spicy mayo. Assorted sashimi on top of California. 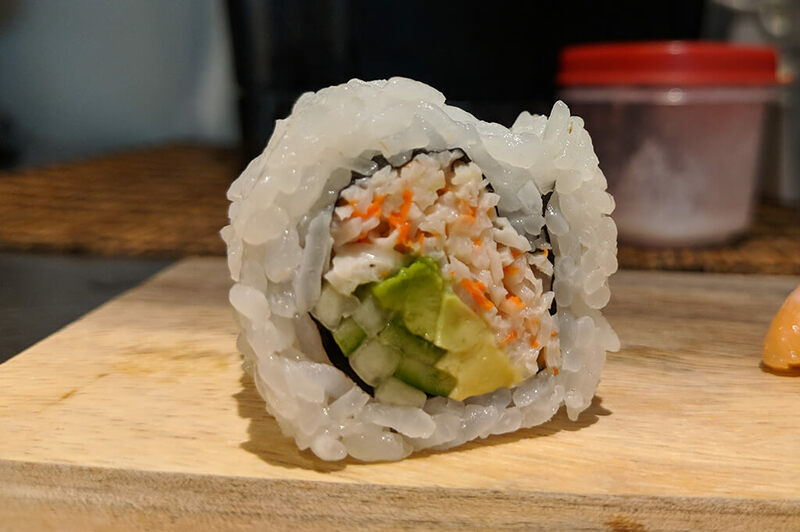 California roll with spicy mayo. Shrimp tempura, avocado, crab, cucumber, asparagus with eel sauce and crunch flakes. Salmon, spicy mayo and cucumber. BBQ eel and avocado with eel sauce. Salmon and avocado on top of California roll. Spicy tuna, cucumber wrapped with avocado with sweet crunch on top with yuzu mayo. 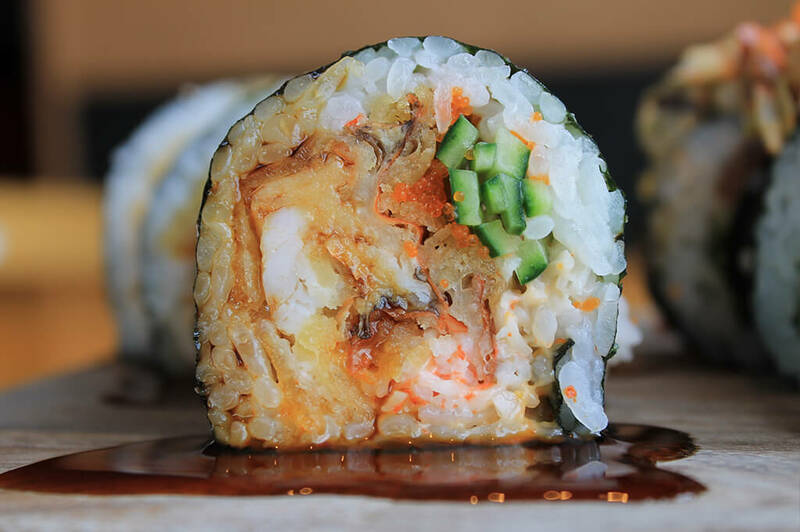 Inside: eel, cream cheese, shrimp tempura, cucumber; Outside: crunch flakes with spicy mayo and eel sauce. Inside: Spicy crab, cucumber; Outside: spicy S.S crab, tuna, salmon, yellowtail, jalapeno, siracha sauce with spicy ponzu sauce on the side. 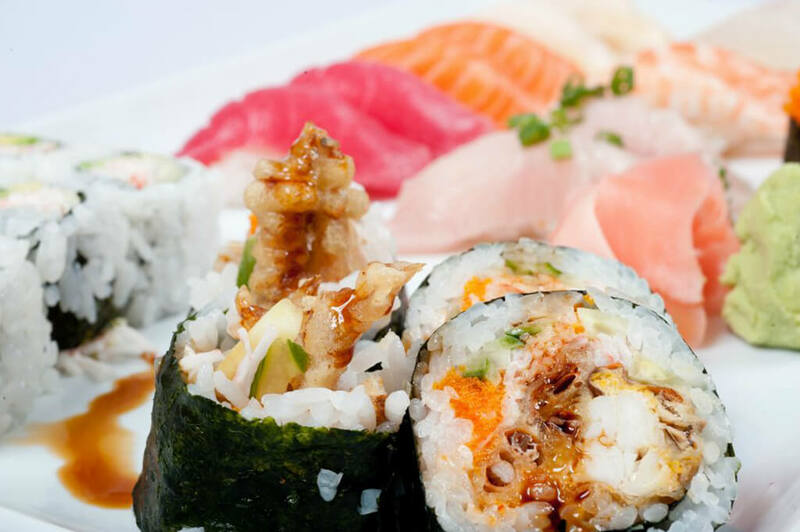 Spicy octopus on top of tuna, salmon, yellowtail, avocado, cucumber & masago roll. Inside: shrimp tempura, cucumber. 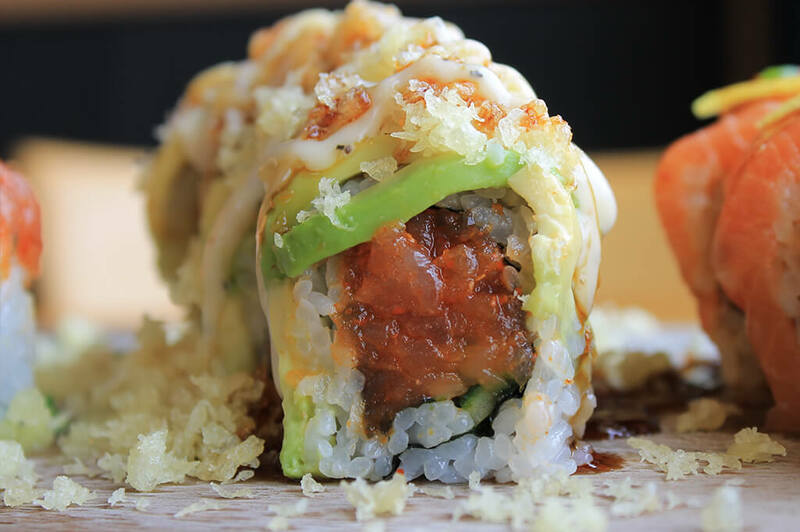 Outside: spicy soft shell crab, shrimp, avocado with spicy mayo, eel sauce, green onions and masago. Inside: spicy crab, cucumber. Outside: salmon & lemon with sweet ponzu sauce. 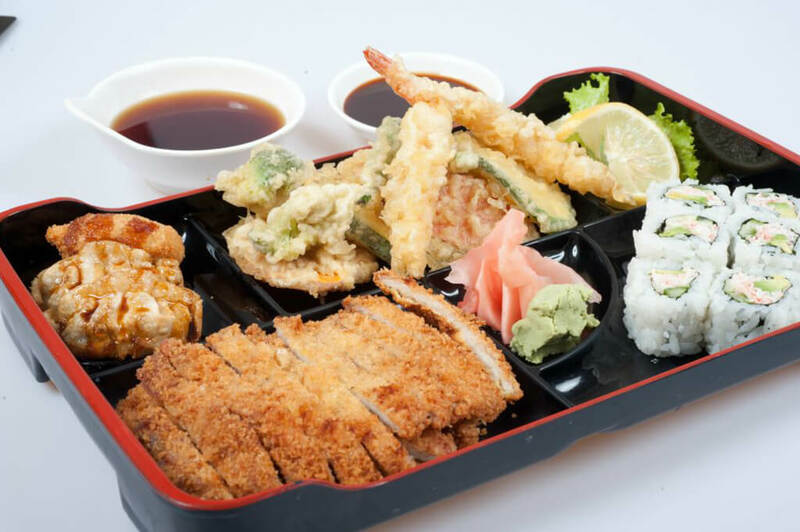 Inside: shrimp tempura, cucumber, cream cheese; Outside: crunch crabs & eel sauce. 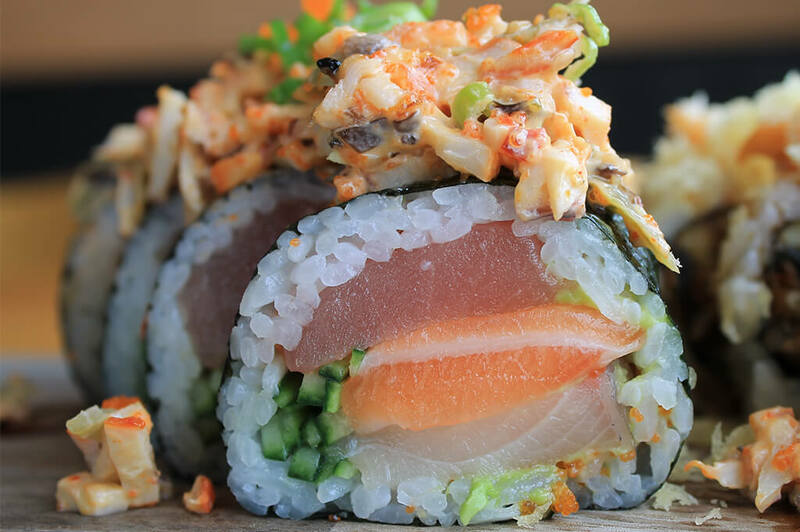 Inside: salmon, yellowtail, green onions; Outside: spicy tuna with spicy mayo & wasabi mayo. 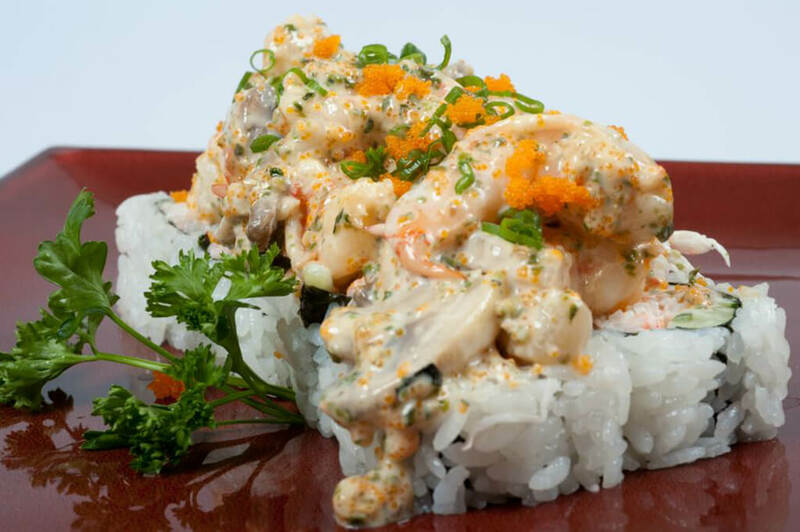 California roll, topped with sauteed shrimp, scallops and mushrooms mixed with Japanese mayo. 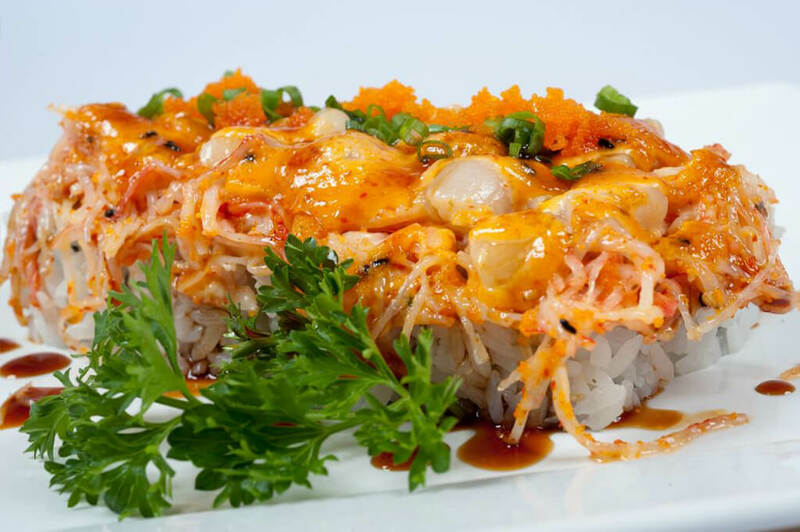 Shrimp tempura roll, topped with baked spicy crab & scallops with eel sauce & green onions. 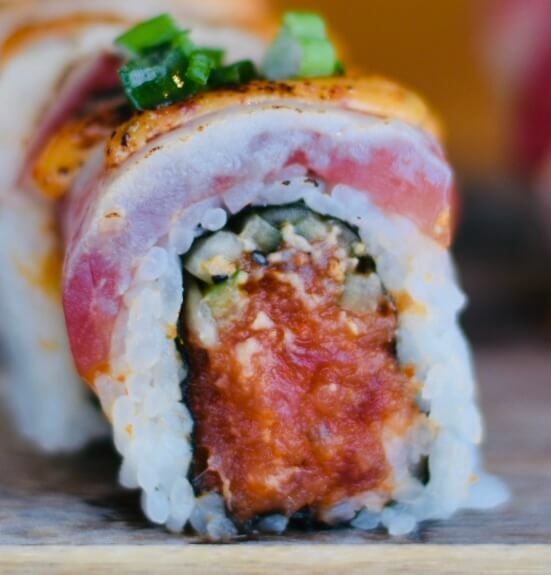 Spicy Tuna & cucumber topped with tuna, spicy mayo & green onions. 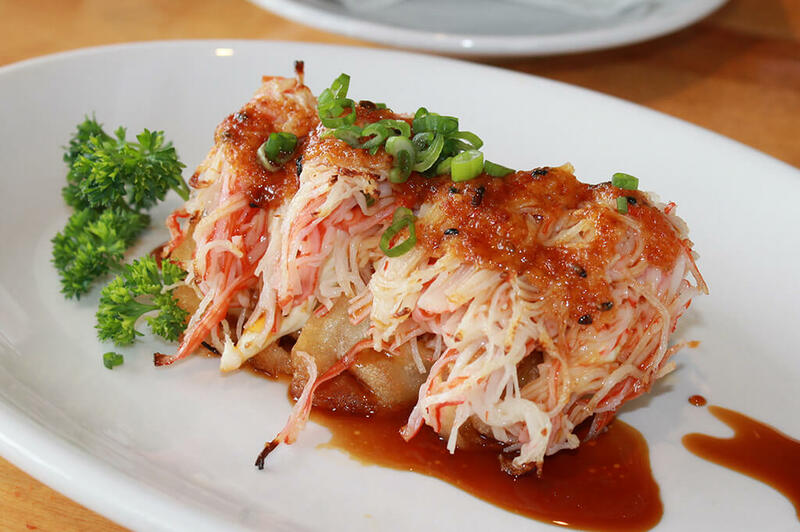 Spicy soft shell crab wrapped in tuna with creamy ponzu sauce (no rice). 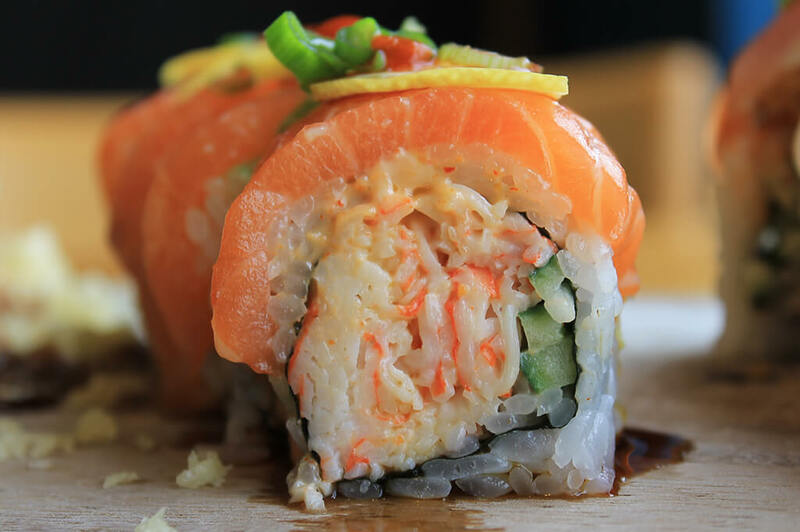 Inside: fish tempura, masago, hot sauce; Outside: crab, halibut and baked with spicy mayo & sweet soy. Inside: spicy scallop and crab. Outside: salmon and lettuce with sweet chili sauce. Inside: spicy tuna and cucumber. Outside: tuna on top with lettuce and garlic ponzu. 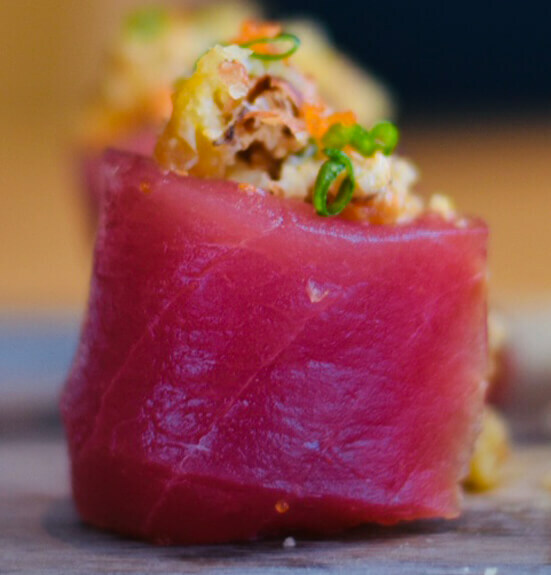 Inside: Tuna, yellowtail, jalapeno; Outside: crab and white tuna with yuzu mayo and seaweed seasoning. 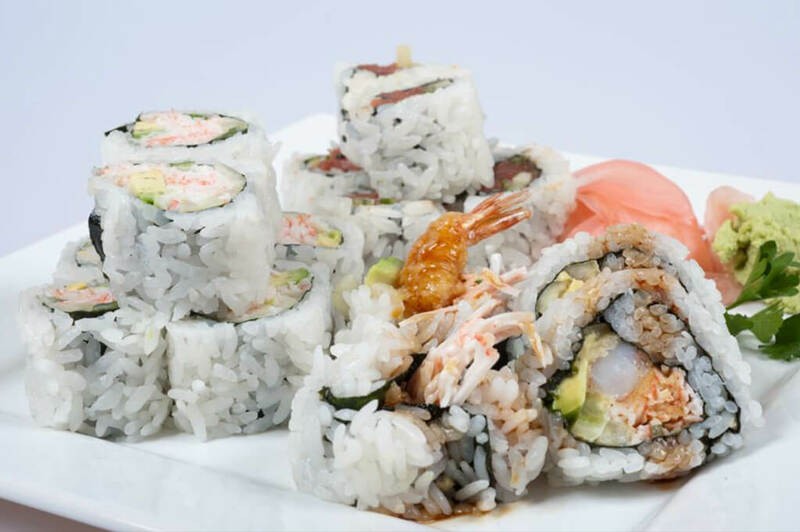 Shrimp tempura, cucumber, crab with shrimp & crunch on top in a sweet chili sauce. Spicy tuna, salmon, crab, shrimp tempura, onion, lettuce, corn. Inside: Shrimp tempura, cucumber. 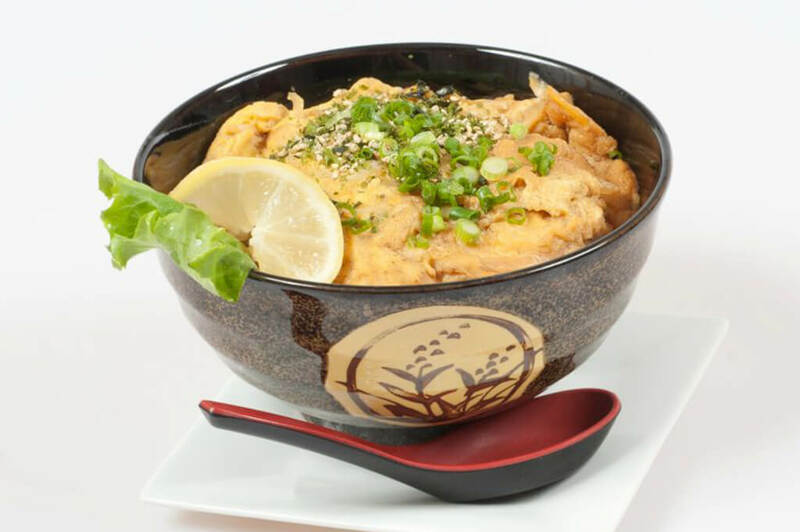 Outside: Soft shell crab, avocado, tuna, green onions, and Screaming O Sauce. Deep fried Salmon, avocado, & cream cheese with baked crab & scallop on top with hot sauce. Deep fried eel, crab, avocado and cream cheese. Shrimp tempura roll topped with Egg yolk sauce on top. 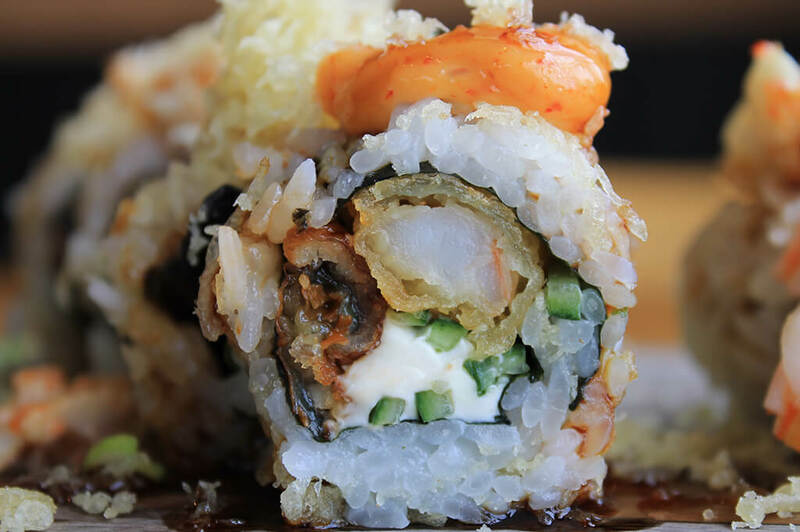 Inside: jalapeno tempura, avocado, spicy tuna, cream cheese. 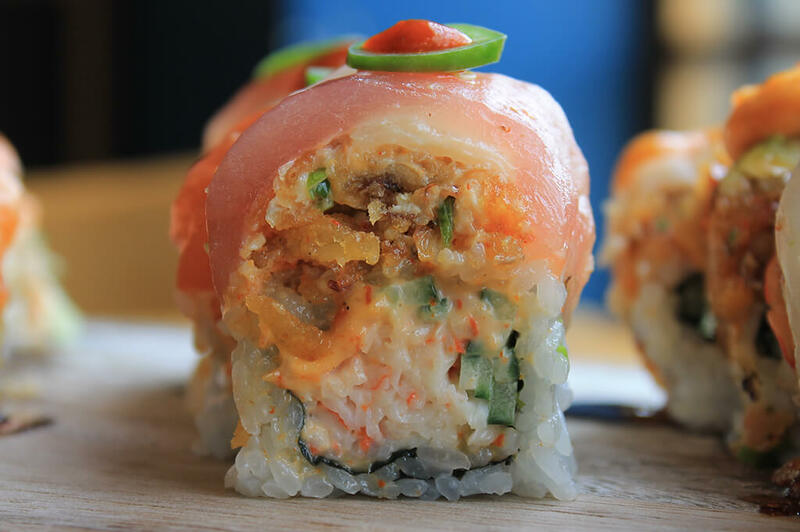 Inside: crunch spicy tuna; Outside: super white tuna & lemon with wasabi mayo & hot sauce on top. Inside: spicy tuna, spicy crab, cream cheese, avocado, tamago and lettuce. Outside: soy paper, crunch flakes with spicy mayo and eel sauce. Inside: crab salad, shrimp tempura wrapped in cucumber. California roll baked with cream cheese on top & eel sauce. Crab, avocado baked with salmon, served with ponzu sauce & eel sauce. 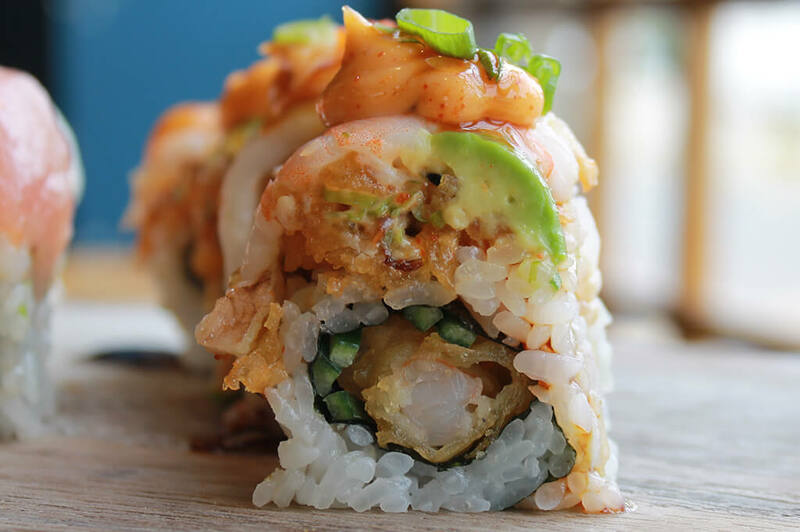 Deep fried spicy tuna, avocado, shrimp tempura, cream cheese & crab roll with spicy mayo, eel sauce and crunch flakes. #3 Choice of Two Lunch Maki. 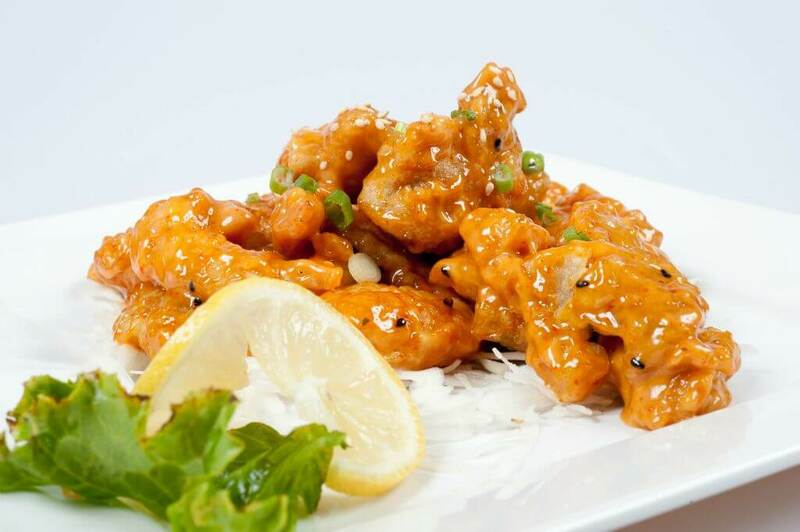 Fried shrimp & mushrooms smothered in sweet & spicy cream sauce. Baked gyoza with cream cheese and crab with spicy mayo and sweet sauce. 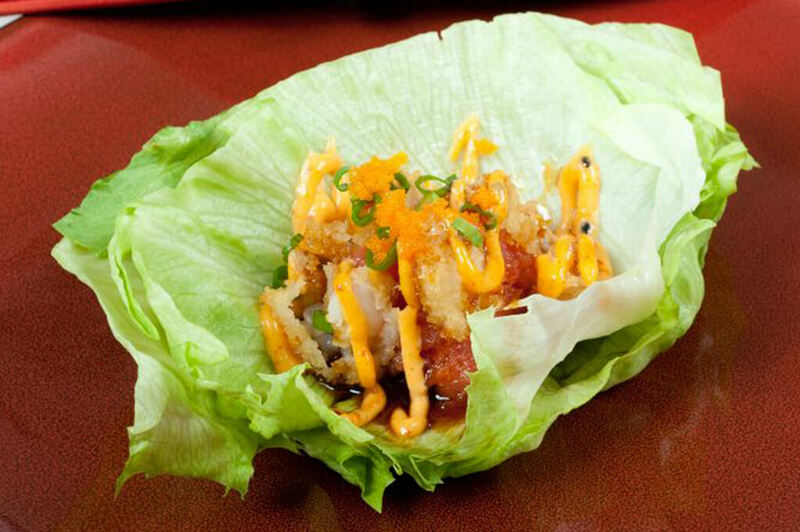 Choice of spicy tuna, spicy salmon or crab salad with shrimp tempura on lettuce. Japanese style fried chicken with spicy mayo. Deep fried whole soft shell crab with ponzu. Deep fried octopus ball with Japanese BBQ sauce and mayo. Lightly salted soybeans, stir fired with garlic and spices. Panko breaded calamari with spicy mayo. 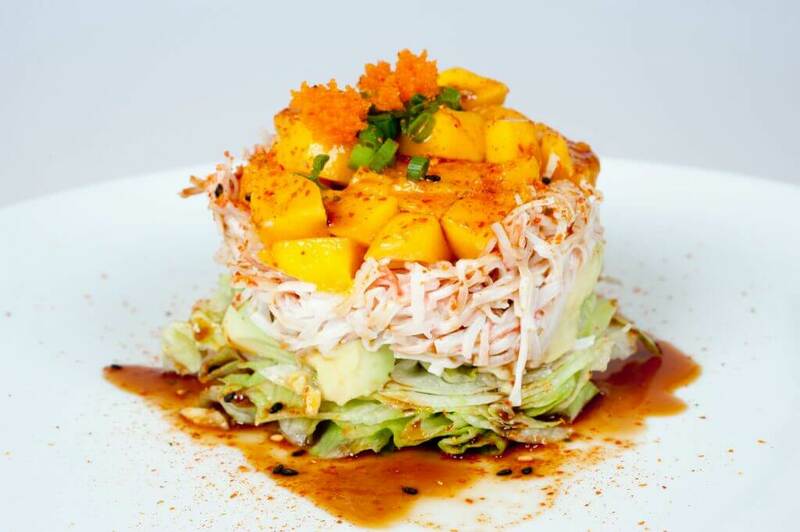 Crab, lettuce, avocado and mango topped with green onions and masago. 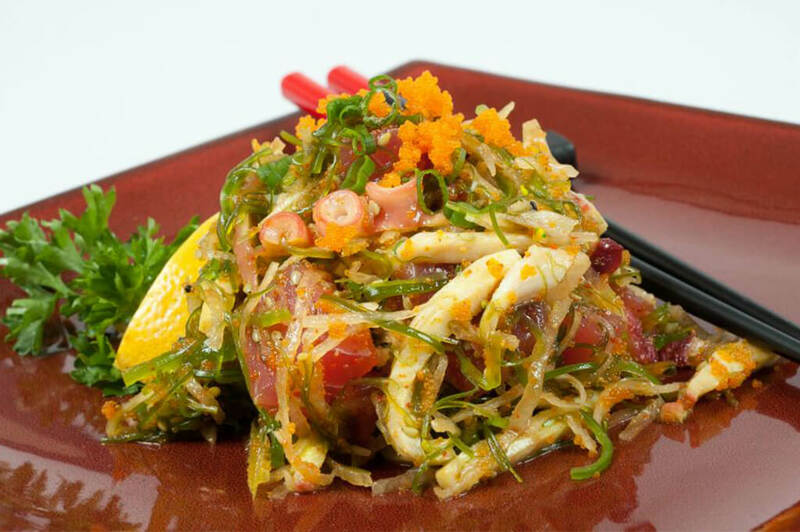 Tuna, shrimp, octopus, masago, shredded radish and seaweed salad. 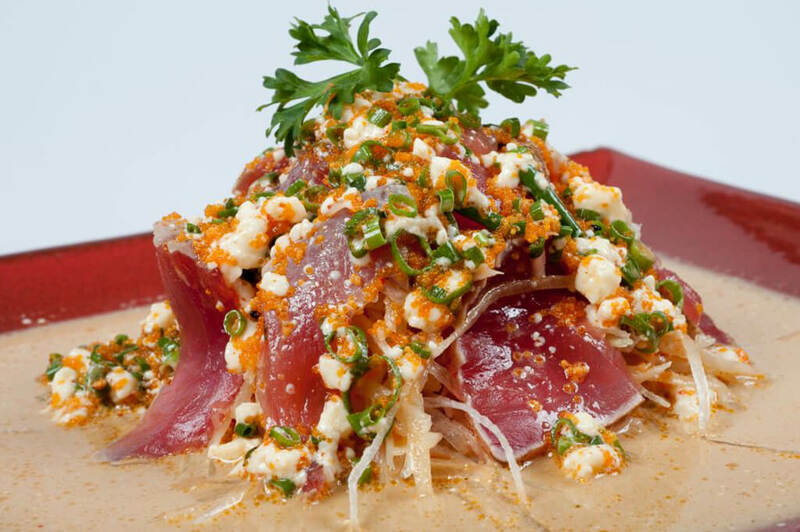 Thinly sliced seared tuna sashimi, shredded radish and masago in a spicy creamy ponzu. Seared salmon, tomato, avocado, cilantro with aji amrilo paste. Spicy tuna with wonton chips. Chef choice fresh cut fish. Seared tuna, onion, avocado and tomato on top of lettuce mix with garlic ponzu. Iceberg and green leaf lettuce mix, carrots and tomato in our house ginger dressing.